Gotham hasn’t been shy about introducing numerous villains in Batman’s city during its first season. Following Monday’s brand new episode of Gotham, the Fox drama aired a brand new preview that gives us our first look at a new villain--The Joker. You can check it out, below. The actor playing the character is none other than Cameron Monaghan, who has appeared in The Giver and Vampire Academy, but in the TV realm is mostly known for playing one of the Gallagher family members on Showtime’s Shameless. Here’s our first look at Monaghan playing the character. 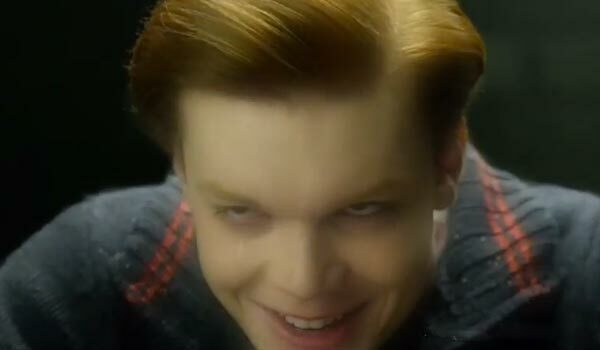 While the new preview doesn’t explicitly state that Jerome is the Joker, the tagline within the preview is, “Gotham’s next villain is no joke,” making it pretty obvious. It’s a little odd that The Joker will be popping up so soon after Heller announced that he will make a brief appearance. In fact, during the February 23 episode, James Gordon and Harvey Bullock will actually be tracking down the Red Hood Gang, which could make for a natural appearance from The Joker, but as it turns out, we’ll get a glimpse of the character a week earlier, when “The Blind Fortune Teller” airs on February 16. The main plot next week will follow James Gordon taking Dr. Leslie Thompkins to the circus, which will come under attack. Interestingly, the February 16 episode will also directly connect to Robin, as it will feature John Grayson and Mary Lloyd (Robert Gorrie and Abbi Snee). Obviously, there is going to be a lot going on during the episode. Fans have been a bit torn about how Gotham has brought in so many key players from the Batman universe before Bruce Wayne has even hit adulthood. We see an adult Penguin and a child-aged Cat(woman) every week, and other villains like Scarecrow and The Riddler have entered the plot, although some of these characters have not reached their full villain potential, yet. Cameron Monaghan is 21 years-old, but he often plays characters who are teenagers, and I’m guessing Gotham is attempting to create a Joker who is at least close to the same age as Bruce Wayne. Hopefully, that will be enough to pacify the fans who are displeased about so many villains entering the story so early. After all, Batman has always been a series with vivid villains, and it only makes sense that a show set up in that world would want to tie those villains into the plot to keep things interesting. As long as those appearances stay believable, I don’t see the show stopping. You can catch new episodes of Fox’s Gotham on Monday nights at 8 p.m. ET.